At a cool $50,000, the set will be available for local authorized showcase dealers to purchase and then sell together or separately (for $25,000 each) to consumers. 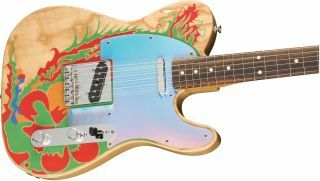 Beginning March 2019, only 50 units of each Fender Custom Shop model will be made available. They will include Page’s personal touches, such as a handwritten signature on the headstock of the mirror model, as well as hand-painted flourishes on the guitar body’s dragon artwork and personally-signed Certificates of Authenticity for both models.